Everyone loves a good public proposal right? Photographer Kerinsa Mullins told WTOP that while she was photographing the special moment, an older couple yelled at her to move out of the way and kept giving her the stink eye. 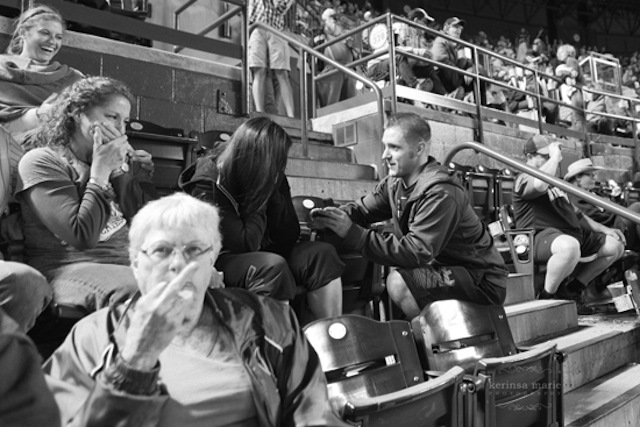 It wasn't until the next day though that she realized the woman had used a particularly rude hand gesture to leave her mark on the couple's engagement photo. But don't worry too much about the couple; the bride told WTOP that she thinks the range of emotion displayed in the photo is hilarious. "I couldn't stop laughing. I said it was the greatest photo I've ever seen," she said. "There is a girl sitting behind us that is so excited for us. My mom is crying, I'm crying, and Ken's nervous and then there's this lady flipping us off."